In the frame of the research project The Sphere. Knowledge System Evolution and the Shared Scientific Identity of Europe we investigate the knowledge tradition that is interwoven with the history of one text: the Tractatus De Sphaera by Johannes de Sacrobosco. This 13th century treatise on cosmology has been published as part of university textbooks up until the 17th century. We have identified a corpus of more than 300 printed books related to Sacrobosco’s text and obtained digital copies – a process that took three years to complete. These textbooks, which were part of the mandatory curriculum in most European universities at that time, contain Sacrobosco’s text in its original version, as well as in translated, annotated or commented form. In addition, publishers included other texts that were seen as relevant for the study of cosmology from fields such as medicine, astronomy or mathematics (Valleriani, 2017). Based on this corpus we seek to study how knowledge innovations have proliferated through the dissemination of texts, and identify the structural and social factors that contribute to or hinder the spread of certain kinds of knowledge. We do so by making use of methods from the area of network analysis which we apply on a dataset that we derived from our literary corpus. This paper presents the foundational work that enables this kind of research with immediate application for similar projects concerned with editorial histories and structural analyses of corpora. We demonstrate the practical application of linked semantic data and the CIDOC-CRM model for shaping and addressing research questions in the humanities (Crofts et al., 2011). Kräutli, F., Valleriani, M., Chen, E., Sander, C., Wintergrün, D., Bertram, S., et al. (2018). 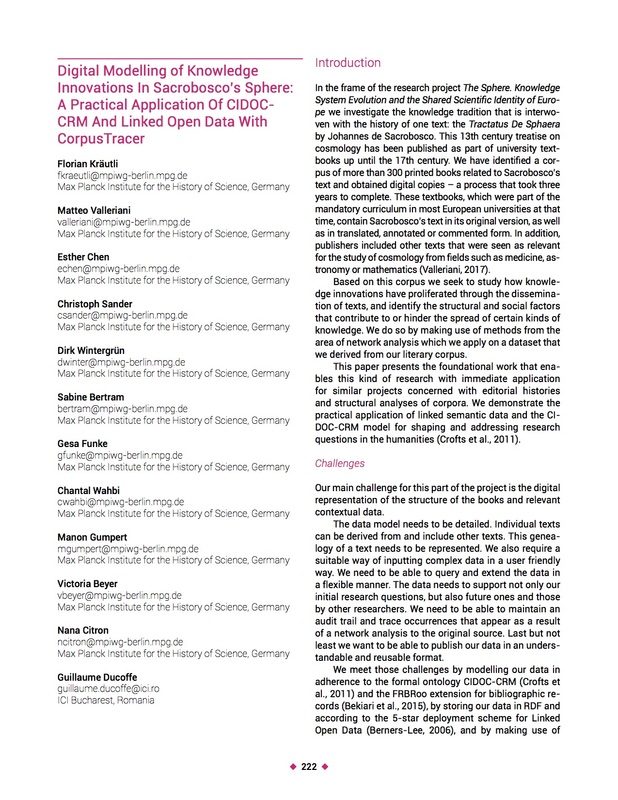 Digital Modelling of Knowledge Innovations In Sacrobosco's Sphere: A Practical Application Of CIDOC-CRM And Linked Open Data With CorpusTracer – DH2018. In Digital Humanities 2018: Book of Abstracts. dh2018.adho.org.